I recently acquired a Powervault MD3000i with several hard drives already installed, and was looking to see if it were possible to purchase additional hard drives without going directly though Dell. The links I found online for the supported hard drive matrix were broken. If it did not end up coming with the correct Dell firmware (i.e. it came with a generic firmware) woud it be possible to flash the correct firmware from Dell? 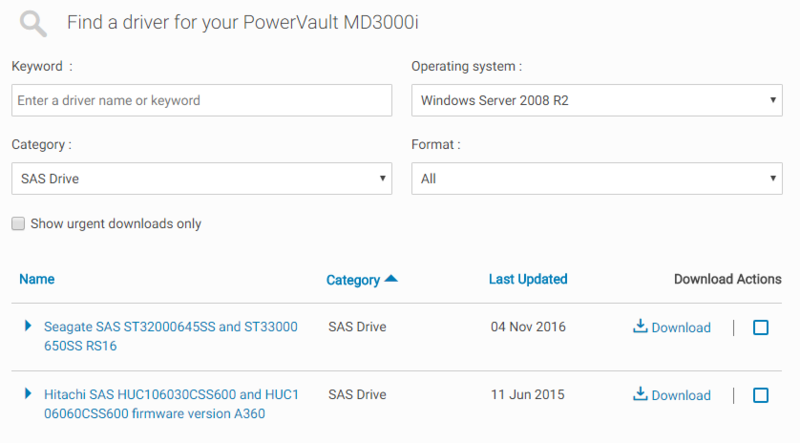 Here is a related question but it did not directly address the 4 SAS drives I found firmware for on Dell's website: Can you use your own drives on Dell PowerVault MD3000i? I ended up speaking with Dell support regarding this issue and am adding this as an answer to help clarify this for others if they have the same question in the future. It was determined that the drive MUST originally be from Dell and have factory installed Dell firmware. I has hoping that we could buy the same model hard drive and then flash it with the Dell firmware from the support page. However, they MUST be Dell branded to begin with. Once they are Dell branded you are able to upgrade the firmware that is on that hard drive. We also determined that the backplane is SAS ONLY so all hard drive will need to be SAS in order to work directly. However the SATA drives can use a interposer board that will let it work with the PowerVault. He recommended that we search for these hard drives from a third party reseller (xbyte, server supply, other used / new drives) by the Dell part number. Listed below are the Dell part numbers for all the 2TB compatible drives. If the hard drives do not come with caddies, the Dell part number for the caddies is CC852, but if using SATA drives they need to have the interposer card which he was unable to give me a part number for. It is highly recommended to gather support bundle from the "Support" tab of the MD Storage Manager before performing any firmware upgrade operations. Also recommend getting another support bundle after the upgrade is complete. This update process will take 60-90 minutes but will vary depending on how long the reboots take to complete. If you don’t need to upgrade your controllers firmware then you can just do the drive firmware. Not the answer you're looking for? Browse other questions tagged hard-drive storage-area-network iscsi or ask your own question. Unsupported 3TB drives - should we expect any issues? What's the top normal S.M.A.R.T. temperature for HGST Helium Ultrastar 8TB 7200 RPM SAS 12Gb/s enterprise drives?